Sandip Raichura July 25, 2018 November 26, 2018 No Comments on What to Trade in a Confusing Market! Obsession with the Nifty index means we often miss out a large variety of trades where trends are forming but we are missing these out as we miss the “wood for the trees”. Smart stock traders know that rotation and cyclicality are generic to financial markets and therefore build simple systems to spot opportunities as soon as they develop by keeping a tab on what matters. And sometimes spend a lot of money doing this. One of the simplest such systems is something known as the Moving Average Crossover strategy. Moving average crossovers are a common way traders can profit in markets. The Moving average is one of the most widely used technical indicators for validating the movement of markets. Moving averages help traders identify trends and empower them to increase the number of profitable trades by making those trends work in their favour. Moving averages help smoothen out the fluctuations, enabling analysts and traders to predict the trend or movement in the price of securities. 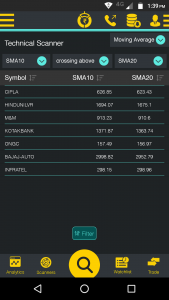 The PL Mobile App (www.plindia.com/plmobileapp) features Technical Scanners in the Scanners section which equips positional traders with all that is needed to construct a simple yet powerful trading system. And because it is free for clients, no need to spend thousands on technical software! A crossover occurs when a faster Moving Average (i.e. a shorter period Moving Average) crosses either above a slower Moving Average (i.e. a longer period Moving Average) which is considered a bullish crossover or below which is considered a bearish crossover. Moving averages (MA) are the averages of a series of numeric values and in stock markets, typically the close prices in a defined time period. They have a predefined length for the number of values to average and this set of values moves forward as more data is added with time. Given a series of numbers and a fixed subset size, the first element of the MA series is obtained by taking the average of the initially fixed subset of the number series. The subset is then modified by shifting it forwards by one value. Larger subsets for calculating moving averages will generate smoother curves and contain lesser fluctuations. This happens as each data point in the subset has lesser weightage when the lookback period is increased, which in turn reduces the variations inherent in the underlying price/volume chart. These moving averages are slower to respond to a change in trend and are called slow moving averages. The moving averages with shorter durations are known as fast moving averages and are faster to respond to a change in trend. Moving averages are known to be lagging indicators, they lag behind movements in the price/volume charts. A faster MA has less lag when compared to the slower MA. There are many different types of moving averages depending on the computation of the averages. The two most commonly used types of moving averages are the simple (or arithmetic), and the exponential. The only noteworthy difference between the various moving averages is the weight assigned to data points in the moving average period. Simple moving averages apply equal weight to all data points while Exponential averages apply more weight to recent data points. A simple (or arithmetic) moving average is an arithmetic moving average calculated by adding the elements in a time series and dividing this total by the number of time periods. As the name suggests, the simple moving average is the simplest type of moving average. It is arguably the most popular technical analysis tool used by traders. All elements in the SMA have the same weightage. If the moving average period is 5, then each element in the SMA will have a 20% (1/5) weightage in the SMA. The weightage to the most recent data is greater for a shorter period EMA than a longer period EMA. For example, a 10 period EMA applies a weightage of 18.18% (2/11), whereas that for a 20 period EMA is 9.52% (2/21). The name exponential moving average is because each term in the moving average period has an exponentially greater weightage than its preceding term. This trading strategy may be designed to generate a BUY signal when the fast moving average ( or MA) crosses up over the slower moving average showing momentum is picking up sharply. Similarly, a SELL signal is generated when the fast moving average crosses below the slow MA. So you open a position when the MA lines cross in a one direction and you close the position when they cross back the opposite way. However, you may face lots of false signals when the market is consolidatitng in a range and/or your choice of moving average periods. However, adding a simple filter to a robust system can be a great way to improve its profitability, The Moving Average Crossover System with an RSI Filter is an excellent example of this. This combination is designed to keep the system out of trades in markets that are not trending, which should also lead to a higher win rate. The RSI is used to confirm the moving average signals. The equilibrium level for the RSI is 50, where if the index is above 50 this suggests bullish momentum. When it is below 50, this indicates bearish momentum. So when the moving averages generate a signal, you can use the RSI to check if momentum is strong enough to justify taking your trade. The system may be designed to enter a long position when the 30 unit SMA crosses above the 100 unit SMA and if the RSI is above 50. It enters a short position when the 30 unit SMA crosses below the 100 unit SMA and if the RSI is below 50. The system exits a long position if the 30 unit SMA crosses back below the 100 unit SMA, or if the RSI drops below 30. It exits a short position if the 30 unit SMA crosses back above the 100 unit SMA, or if the RSI rises above 70. You may implement a trailing stop that is based on the the most recent low for a long position or the most recent high for a short position. To make it convenient for you to do this, the Technical Scanners section at PL Mobile App (www.plindia.com/plmobileapp) where we present a large range of slow and fast simple moving as well as exponential moving averages. In addition, you don’t have to go elsewhere for the RSI readings – the same scanner also features indicators including the RSI readings so you know all the important variables at the same place. We would suggest you look at all the stocks that just started showing BULL or BEAR signals basis your moving average selection and wait for RSI to demonstrate a cross over 50. Such shortlisted stocks may be stored in the watchlist and as soon as you see a volume pick up as well as price pick up (see the RISE AND FALL SCANNER in the PL mobile app that shows volumes and price change over a 3 day period) , you know you have got some positional trade to ride the rest of the way! As you begin to use this strategy and encounter different market conditions, over a period of time you will learn to modify the averages as per your experience. Select a maximum of 4-5 counters in a month and ride these with variations of the above strategy and you may well be on your way to becoming a smart trader. And yes, the simplicity of it all will mean you have more time on your hand to focus on improving results.